A YOUNGER cohort of fish enthusiasts are sparing no expense to own an auspicious dragonfish, more commonly known as the Asian arowana, in the Year of the Dragon. Aquariums and fish farms here told my paper that they have seen a recent spike in sales of the prized ornamental fish, which can sell for up to $10,000 each. Rare breeds are known to sell for even more, at up to $40,000 each. 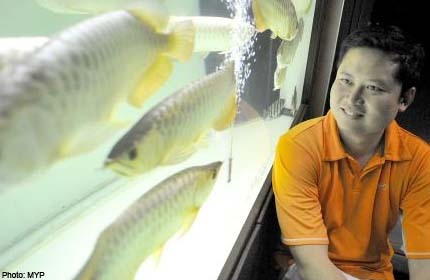 Mr Angus Ang, owner of Stones Aquarium, a shop in Sin Ming Road specialising in arowana and exotic fish, said: "The average customer used to be middle-aged but, recently, more young people have taken a huge interest in arowanas." Stones Aquarium estimates that 70 per cent of its customers consist of young people. On average, its customers are in their late-20s to early-30s. Qian Hu Corporation, an ornamental-fish service provider in Choa Chu Kang, also noticed a surge in younger customers. "Some of these young people are even opening their own fish shops," said Mr Jimmy Yap, Qian Hu's business-development manager. Arowana sales at Qian Hu were up 30 per cent in the four weeks prior to Chinese New Year, compared with the same period last year. Young executives make up the bulk of the customers. "The younger customers are more knowledgeable than the older buyers. They study the fish and learn how to take care of them, and also have the money to invest in them," said Mr Yap. Mr Dragon Seah, owner of the Singapore Dragonfish Farm in Lim Chu Kang, said: "Young people are getting more savvy. Most of them buy arowanas as an investment and not just because they like rearing fish." At his home in East Coast, Mr Robin Loh, 31, keeps a collection of over 100 arowanas, including several very rare albino varieties. Each fish can cost between $400 and $10,000. He first started buying them in 2003, and went on to buy three to four fish every month. This year alone, he had 50 arowanas delivered to his home just before Chinese New Year. "It has become almost an addiction, after all this time," said the deputy managing director of his family's logistics business.